Susanna "Susie" (Harbaugh) Conn Strickler was born on Nov. 5, 1873 on a farm at what is now Clairton Lake near Scullton, Somerset County, PA, the daughter of David and Mary Magdalene (Whipkey) Harbaugh. 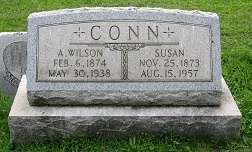 Susie married Alexander Wilson "Wils" Conn (1874-1938). He was a farmer, and they lived on part of the old Harbaugh farm, along what today is the lake, though at the time was a small stream. 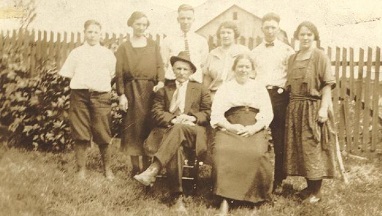 Their six children were Nora Alverta Nichols Snyder, Jessie "Gertrude" Firestone, Iva Lucretia Henry, Harvey "Clinton" Conn, Jesse Conn and Daniel "Lester" Conn.
Iva and Clint are seen at right. Little about the Conns' lives is known, other than a few morsels found in family records. In about 1890, when Susie was 16, she wrote a poem in the autograph book of her sister Letitia. In August 1926, when Susie's mother celebrated her 94th birthday, Susie and Wils threw her a surprise birthday party at the old homestead. More than 225 relatives and friends showed up. The affair was in the form of a family reunion and will remembered as a very enjoyable occasion. The family which dates from Casper Harbaugh, who settled in Somerset county in 1732, has spread to many points. Five generations were represented at the reunion.... At noon a basket picnic dinner was served under the shady trees. A panoramic photograph of the picnic is seen below, taken by New York Studio of Connellsville. It was such a successful event that it was decided to hold the reunion again the following year, and officers were elected to carry out the plans. During late spring 1938, Wils was stricken with an incurable case of pneumonia. He died on May 30, 1938, at the age of 64. His remains were laid to rest in the Jersey Church Cemetery near Ursina, Somerset County. A short obituary in the Connellsville Daily Courier noted that he was survived by 15 grandchildren and four great-grandchildren. 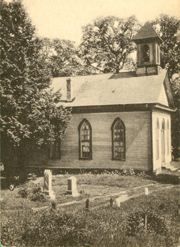 The church and cemetery where Wils rests for eternity are seen here in a rare old postcard photograph. It is the oldest church site west of the Allegheny Mountains, and many branches of our family are buried here. In 1942, as she neared age 70, Susie is known to have traveled almost monthly to visit her sister, Rosetta (Harbaugh) Miner in Connellsville, PA.
Heartache rocked the family in 1945, at the end of World War II, when Earl J. Peters, husband of granddaughter Reba (Firestone), was killed in action in the sinking of the USS Indianapolis. At some point, Susie's homeplace was purchased by the Clairton Angler's Club. The property, along with other adjacent parcels, was flooded with a manmade dam, to form what is now Cranberry Glade Lake. After seven years as a widow, on Sept. 24, 1945, Susie married her second husband, Jesse O. Strickler (1869-1956). Jess had been married before, and brought six children to the marriage: Henry Ray Strickler, J. Willis Strickler, Emily Barner, Paul E. Strickler, Dwaine Strickler and Lloyd Strickler. The newlyweds made their home in Perryopolis, Fayette County, PA. Jess was a member of the Great Bethel Baptist Church of Uniontown and of the Curfew Grange in the village of Flatwoods. They are seen here in a photo sent to Susie's sister Martha Jane Laughery in Delaware. More sadness struck in early 1954, when daughter Nora died, of causes unknown. In the 1950s, the Stricklers are known to have kept a boarder at their home. The boarder (identity unknown) helped with house chores when he got home from work at night. After Susie married Jesse, they decided to travel to Illinois to visit her sister Letitia Stoner and niece Agnes Wood. Susie's son and daughter in law, Lester and Cornelia Conn, went along as "chaperones." 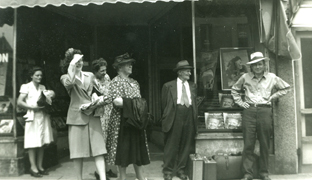 A series of remarkable photographs shows the Stricklers, Conns and Woods at a bus stop, presumably in Illinois. It was probably the last time Susie saw her beloved sister. Susie enjoyed attending the Harbaugh Reunions, which had become an annual tradition and continued through the rest of her lifetime. She must have taken great pride when distant cousins Cora Bell (Harbaugh) Cooprider and son J.L. Cooprider, of Evansville, IN, authored a book called Harbaugh History. The 1947 volume contained entries on Susie's parents and all of her sisters, brothers and their children. Susie received the award for "Largest Family Present" in 1954, and Jesse won the award for "Oldest Man Present" the same year. We was at the reunion last Sunday. Mat Gosage was the oldest one their. She said she was 97. She said she was not to well. My 2 girls was their and Jess and Clint, Nora youngest boy Wilson and his wife and children, Minnie Gary and John Miner, Edgar Ream and his family, most of them, Warn Younkin, Frank and his family, Lena Doyel was their. Coopriter was not their but I miss Nora and Rosette. Nora was their last year. Rosette was not their last year. She Died on wedsday after the reunion. One July in about 1954, from Perryopolis, Susie wrote to sister Letitia, saying: "Our garden is real good. We had peas, beets, new beans and plenty of new cabbage to use." She also reported on visits from her stepson Paul Strickler from Washington, DC, as well as from niece Agnes Wood from Oblong, IL and nephew David Younkin from Connellsville. She also said her daughters "Gertrude and Iva has not bin here for some time. They don't get home often as they both work." Had a letter from Leona [Wilkerson] a short time ago and Ira Lokery [Laughery] and his wife was here several weeks ago ... and yesterday Clint and his wife and family was here for dinner. Iva still lives at Kingwood and Gertrude still lives at Confluence and Lester still at bible school and Jess still at McKeesport... One of Nora's boys and his little girls was here the other Sunday to see us. Well we was glad to see them come. Mam has not been good. She has been going down for more than a year. She only weighs 124 lbs. and she is getting weeker all the time. I slipped this in without her knowing it. Mam is some stronger but cannot see good enough to write so I am writing for her.... Mam says to tell you we are all getting old and can't do mutch any more... We sure are having winter this time. It has been cold and snow ever since Thanksgiving. The roads are icy and we don't go very mutch. Tell [your children] I didn't get any deer this year but I sure got my share of ring necks. 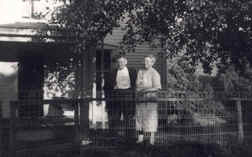 The Stricklers are seen here, in front of their home in Perryopolis, circa 1953 during a visit by the family of Susie's sister Letitia Stoner. Jesse died in their dwelling at the age of 86 on Feb. 21, 1956. Funeral arrangements were handled by the Blair Funeral Hope in Perryopolis. The Connellsville Daily Courier reported that his survivors included 16 grandchildren and six great-grandchildren. Entombments was in the Mount Washington Cemetery near Perryopolis, with the Odd Fellows lodge members supervising rituals at the burial. We was to see Aunt Susan Saturday afternoon. I was in the room where she lays but she is about the same. You ask if she knows things by times (no) but when people go in and talk she gets so worked up. She just has Gertrude help her up and down all night. They all should consider Gertrude's side of it and walk in and not be talking till they go out of the room... Aunt Susan could last a year yet or could go at anytime. She don't eat enough to keep a bird alive. Where Aunt Susan's home had been, that nice bottom land of theirs, is almost covered with a lake or fishing dam and cabins are built all around. If you would go in yourself you wouldn't know the place at all. Susie passed away just 10 days after the letter was written, on Aug. 15, 1957. She was buried with Wils, her first husband, at Jersey Church Cemetery.